The Mad Gaffer II is a 35 foot Henriques Maine Coaster. Captain Ray Burke has owned and operated Party Charter Boats out of Shark River for over 35 years. He is one of Belmar's most experienced and skilled skippers. After owning five large party boats, the largest being the 100ft. "Optimist Shooting Star", he decided to downsize to charter boats in order to take a more personal role in his fishing business and to provide better service for his customers. Both he and his crew would like to welcome you to spend a pleasant day sport fishing aboard the Mad Gaffer II. and targets the following species of fish. 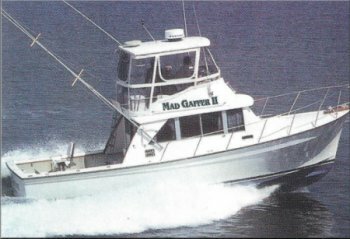 The Mad Gaffer II offers a slightly different concept in charter boat fishing, due to the fact that as well as taking private charters, we also run open and take individual reservations. If you can't get all of your friends together to charter a boat, you can come by yourself and we will supply you with new friends. Please note that we limit our boat to 12 fishermen. This gives you quite an edge when it comes to fishing over a crowded party boat. We do all of this at just slightly over party boat prices. please call: the boat at (732) 803-6276.